High Wire Networks spent the past six months implementing a network refresh or upgrade for a reputable autobody repair chain, on-site at more than a hundred locations nationwide. We not only delivered on time and on budget, but also received accolade for our outstanding customer service and professionalism. Our sales executive and project managers worked with our value-added reseller client to identify the end-customer’s requirements to replace outdated hardware at all its locations. They deployed High Wire’s engineers to survey each site to better understand the scope of the project. It was vital to keep an open trialogue between High Wire, the client and end-customer from start to finish. Through this vetting process, High Wire identified future cabling and equipment locations and documented any customized needs and requests. Within two days of the survey, High Wire’s engineers shared their findings, including the price and deadline goals. The customer happily gave High Wire the green light to start. High Wire always places the right people with the right skills in the right place to get the job done. We sent our technicians to every site to replace outdated hardware with new routers, telephones and computers using the appropriate switches, cabling, wireless and desktop locations. 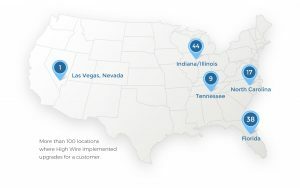 “We held individual review and planning calls for every site as each building was unique and had its own specific needs,” said Mark Rivecco, director of operations at High Wire. This project, while large in scale, still required technicians to specifically tailor their services to the diverse needs of each location. The autobody repair chain did not have a cookie-cutter information technology model; every location had a distinct landscape and required detailed focus and analysis.